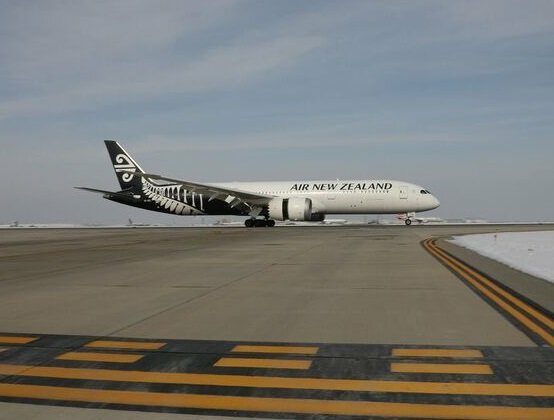 Air New Zealand’s inaugural flight between Auckland and Chicago landed at O’Hare International Airport this afternoon. Flight NZ26 departed at 5:01PM local time in Auckland and landed in Chicago at 12:11PM local time in Chicago. With a flight time of approximately 15 hours northbound and just over 16 hours southbound, the flight is Air New Zealand’s longest, taking over from Auckland-Houston which has a flight time of 13.5 hours. Air New Zealand Chief Executive Officer Christopher Luxon, who travelled on the inaugural flight, says the airline’s new Auckland-Chicago service means exciting new opportunities for travelers to explore the United States’ third-largest city, along with more of the East Coast of the US and Canada. “We’re excited to offer our customers a direct link between New Zealand and Chicago. With our alliance partner United operating more flights out of its hub of O’Hare International Airport than any other airline, the new service to Chicago provides customers with convenient one-stop codeshare connections to approximately 100 destinations across the US. “New Zealand already welcomes around 340,000 visitors annually from the US and we anticipate this number will grow with the introduction of this new service. We expect the route will contribute around NZD$70 million annually to our economy – and we know 50 percent of spending by US visitors is done outside the main centers,” says Mr. Luxon. Chicago is an exciting destination with plenty to offer its 55 million visitors each year. Among the biggest attractions are: Chicago’s fascinating history, world-class museums and stunning architecture; the internationally renowned jazz and blues scene, and award-winning restaurants and culinary dishes, including the iconic deep-dish pizza. Jamie L. Rhee, Commissioner of the Chicago Department of Aviation says the City of Chicago is proud to partner with Air New Zealand to welcome new service to Auckland from O’Hare International Airport. “As the best-connected hub in the U.S., the addition of new service to Auckland enhances Chicago’s growing global connectivity, as well as traveler choice, by making Chicago one of few cities with direct air services to the six major inhabited regions of the world. We want to thank Air New Zealand for its commitment to Chicago. This new route is expected to generate $75 million in annual economic impact in the Chicago area, and will spur new jobs and opportunity for those who call Chicago home,” says Mr. Rhee.